Already a week into August...how is this possible? Summer is flying by this year, and I'm sure that it is doing so at a faster rate than ever before. (Is this what it means to get older? Yikes.) I do believe I've been in a bit of denial about this passage of time, this season, convincing myself that it's not moving nearly as quickly as it appears to be. That we still have ages before school starts...that the house still could close on time...that it's entirely possible that we could be moved in before school starts...that it hasn't been over a week since my last post...Ignoring all evidence to the contrary, I've been reveling in the heat and sunshine with the Kiddos. What else can be done? I certainly have no control over banks and their ridiculously slow speed (time again, see?) with real estate transactions. School will open in a few weeks, ready or not. Father Time trudges on, despite my feelings on the matter. (True, it is possible that I have some control over when I sit down to write.) So, in a One-Woman Stand against that which I have no control, I've been living in blissful ignorance (mostly, except for those moments of panic when reality sets in), and soaking up Summer, because look, people: It will be gone in the blink of an eye. The past week has seen us enjoying pretty much every sort of water source available, from the Puget Sound, to mountain and foothill lakes, and on out to the Coast. And today we're hitting the pool. Not a bad way of keeping it cool. With all the adventuring going on, as well as the heat, things have been kept pretty simple in the kitchen. Salads abound, and homemade ice cream for dessert bribes those who ask: "Salad again?" 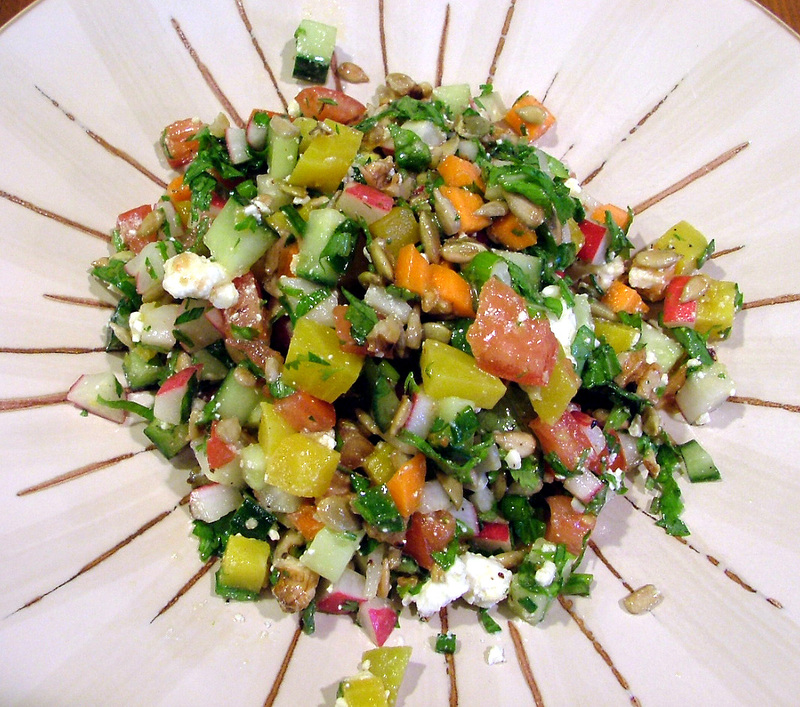 I spotted a beautiful salad recently on davidlebovitz.com, and I highly recommend it. 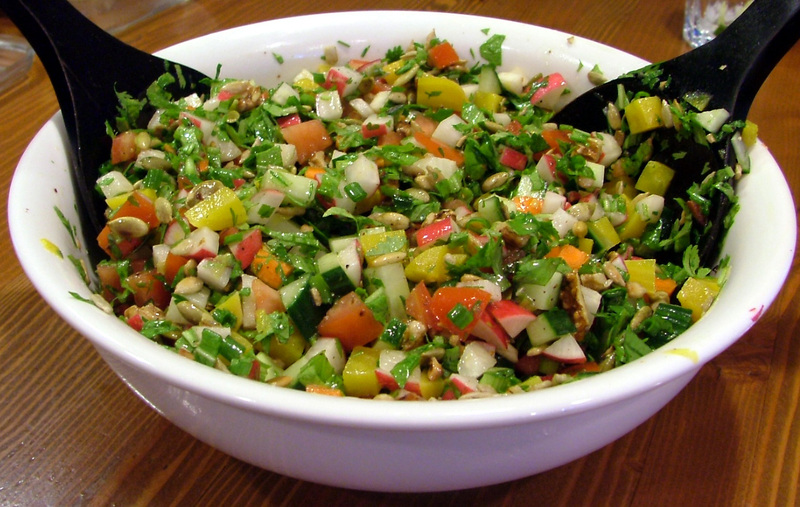 Inspired by his travels to Israel, this Israeli Salad (recipe here, on his blog) is a complete stunner. Vibrant, crisp, and filling, it's perfect for throwing together on a hot evening. The only changes I made (for what need is there to change a Lebovitz recipe?) were purely out of necessity: I substituted golden beets for the red, because that's what I had. I omitted the pine nuts, and used sunflower and pumpkin seeds, and walnuts, because I tend to panic and run away from them in the store, when I see the price. And instead of the red onion, which I lacked, I used a few scallions. To Summer! And to being fully present for all it has to offer, before it moves on.